The Singapore Biennale opened one week ago, and we’re so excited by the buzz that DomoGeo’s architect and Product Development guru, Eko Prawoto, is generating that we just have to share. 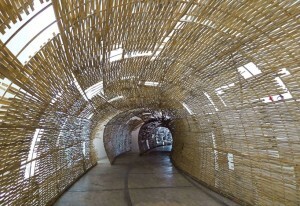 designboom, which bills itself as the world’s first web-based art, architecture and design magazine, has some great photos of Eko’s Wormhole installation, including a fabulous interior shot that helps those of us not in Singapore imagine what it’s like to walk through the conical bamboo structures. But what’s really cool is the press around Eko’s approach to architecture, design and community in the developing world—something dear to our hearts here at DomoGeo. Eko said that after the earthquake, outsiders looking at the situation might have had one thought only: everything is gone. But at second glance, the picture looked quite different. 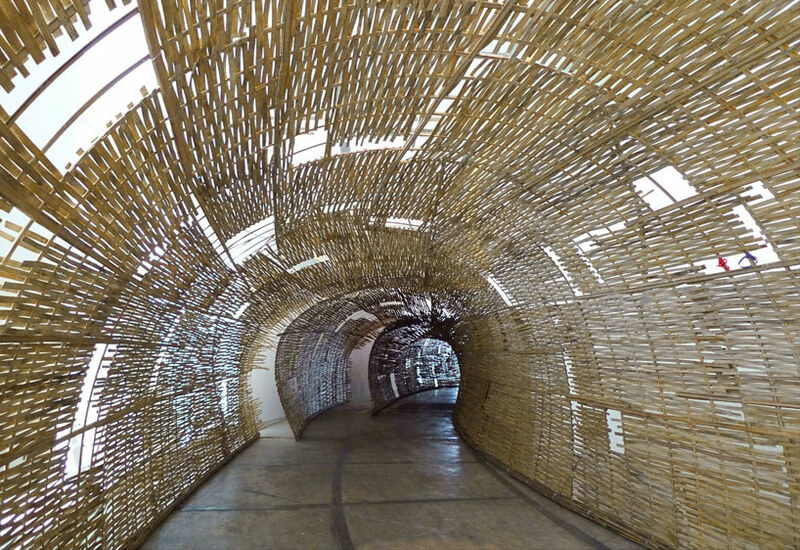 Working with natural materials like bamboo and straw isn’t new to Eko, and involving communities in his projects isn’t either. Local Singapore publication Today also dives into Eko’s aesthetic, known as “gotong royong”, or the spirit of cooperation between communities. Eko says he learned this approach back in 2004, when foreign relief organizations rushed into Aceh after the devastating tsunami and began building single-family houses. Rather than simply rushing in to help rapidly build new houses [in 2006], Prof Prawoto invited the community to participate in the planning and ended up radically changing his own plans after taking the time to listen. Instead of building stronger concrete structures as he had intended, his team used wood or other local materials and even redesigned windows and bathrooms to fit the styles that people preferred. It’s also a large part of why Eko is working with DomoGeo. Our CEO and founder, Hasan Alemdar, spent two years living in periurban Asia getting to know its people and their preferences before beginning the design process on our houses. And his understanding of their needs and wants led him to realize that a house wasn’t enough: which is why we offer income-generating houses that are coupled with affordable financing.